Mom's Gone Bronson! 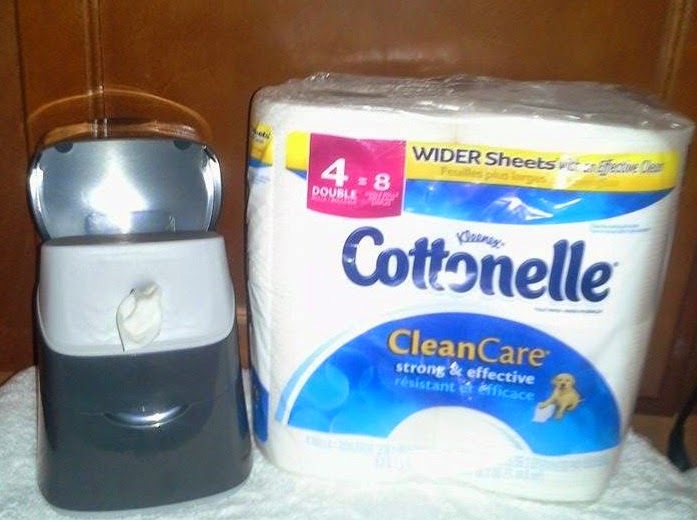 : A Clean and Comfortable Care Routine Starts with Cottonelle AND Savings! A Clean and Comfortable Care Routine Starts with Cottonelle AND Savings! Let's face it, we all have to go to the bathroom once [or more] a day and sometimes regular toilet paper just isn't enough to give you that all day freshness that I have recently discovered that you CAN get with the simple addition of a moist wipe to jazz up my routine! There is no shame here! A clean bum is a comfy bum and I want the best, which is exactly what I get from Cottonelle Clean Care Toilet Paper and Fresh Care Flushable Moist Wipes which, when used together, are the super-heroes of my bathroom routine! I love that I can feel completely clean and confident in that I am doing the best for the entire family, including our potty-training 3 year old who is just learning to do everything by herself and creating a bathroom routine of her own - incorporating the tuggable-huggable 2-ply softness of Cottonelle Clean Care Toilet Paper and the one-touch, alcohol-free Fresh Care Flushable Moist Wipes into that routine - she's a big girl now and we are all fresh and clean together! Bum wipes all around! From one generation to the next, Cottonelle Clean Care Toilet Paper and Cottonelle Fresh Care Flushable Moist Wipes continue to care for bums everywhere if you let them - and what better way to do so than with a coupon savings from Rite-Aid, too?? Just CLICK HERE FOR YOUR COUPON to save $1 on your next purchase from Rite-Aid and Cottonelle by visiting their landing page, watching a very short video and grabbing your $1.00 coupon off your purchase of Cottonelle Clean Care toilet paper and Cottonelle Flushable Cleansing Cloths/Wipes, today! Go ahead! Treat your bum like the king [or queen] it is, to match the throne it sits upon, just like mine!